The State Fair of Texas begins September 26 and visitors can ride DART directly to the front door. The State Fair of Texas is so big it’s accessible from two different DART stations: Fair Park Station and MLK, Jr. Station. Both of these stations are on the Green Line. Red, Blue and Orange line passengers coming from the northeast can transfer to the Green Line at Pearl/Arts District Station. Red and Blue line passengers coming from the south can transfer to the Green Line at West End, Akard, St. Paul or Pearl/Arts District stations in downtown Dallas. Orange Line passengers coming from the northwest can transfer anywhere from Bachman Station to Pearl/Arts District Station. If you’re at least able to waddle after the fried food consumption, please board a Green Line train at Fair Park or MLK, Jr. stations. DART will be running extra Green Line service during the entirety of the State Fair of Texas. The fair closes at 9 p.m. Sunday through Thursday and 10 p.m. on Friday and Saturday. The last DART train leaves the State Fair of Texas shortly after midnight. 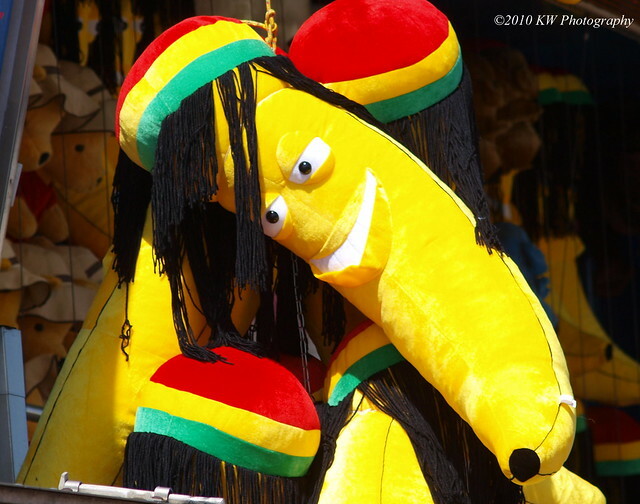 Can I bring a gigantic stuffed reggae banana on the train? Yes, but please keep it on your lap and out of the aisle. Giant stuffed animals that require a seat will need to have their own ticket to ride. What about those coming from the west via the Trinity Railway Express? Welcome to the east side! Those riding in or out on the TRE can transfer to a Green Line train at Victory Station. The TRE will be running special service, (including Sunday) for the duration of the fair. Please note the last train heading west will leave Victory Station at 11:11 p.m. nightly. Find more information about the TRE schedule here. How much does DART cost? A day pass for adults if $5.00 and $2.50 for children or seniors. Learn more about our fares here. You can also pre-purchase your transit passes with our GoPass smartphone app. Please note that your phone will need to have enough charge to show your GoPass ticket to a fare enforcement officer, so please keep a close eye on your battery life as you take pictures of every fried food item. Most importantly: Have fun! Find more about DART service to the State Fair of Texas here. This entry was posted in Service, State Fair of Texas. Bookmark the permalink.